I can still recall what my first bike or should I say trike looked like. It was pink, it had ice cream cones on the seat and I believe that it has tassels that came out of the handlebars. My first real bike though was yellow and it had a banana seat. I sure loved that bike, it took me everywhere. I have fond memories or riding that yellow one speed with my Dad while he was on his evening runs with our dog, Sparky. The route we would take involved going up an overpass. My little legs didn't have the strength to peddle that bike over the overpass, so my Dad would push me while he ran. My Dad has always (since he was a teenager) loved to ride road bikes. 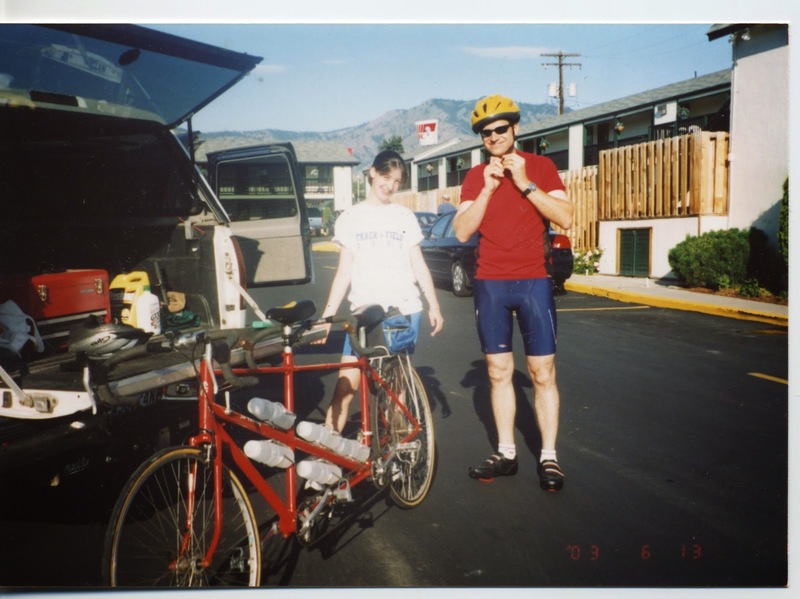 When I was about eight years old he purchased a tandem bicycle and install a special crank system so that I could ride the bike with him (my legs were too short at that point in my life to reach the peddles). We would hook a bike trailer to the back and pull my two younger sisters around town. It was always a good time. 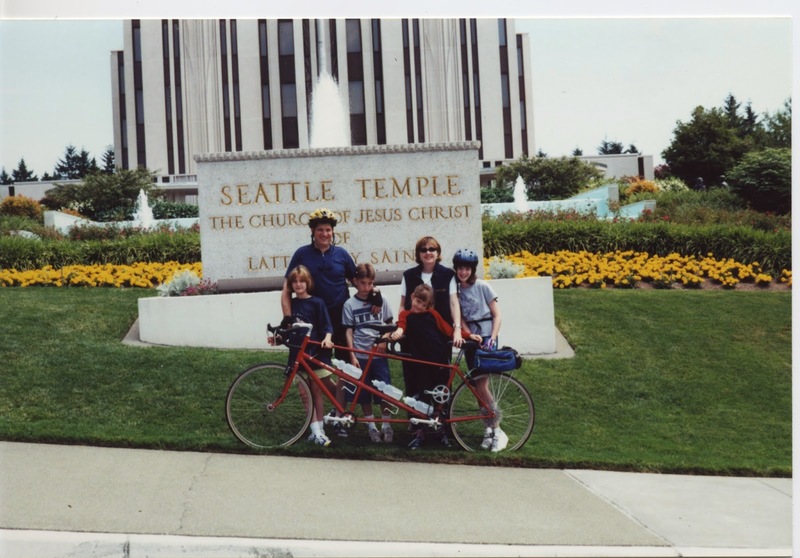 Our family has gone on many bike rides over the years. The long rides were always my favorite. 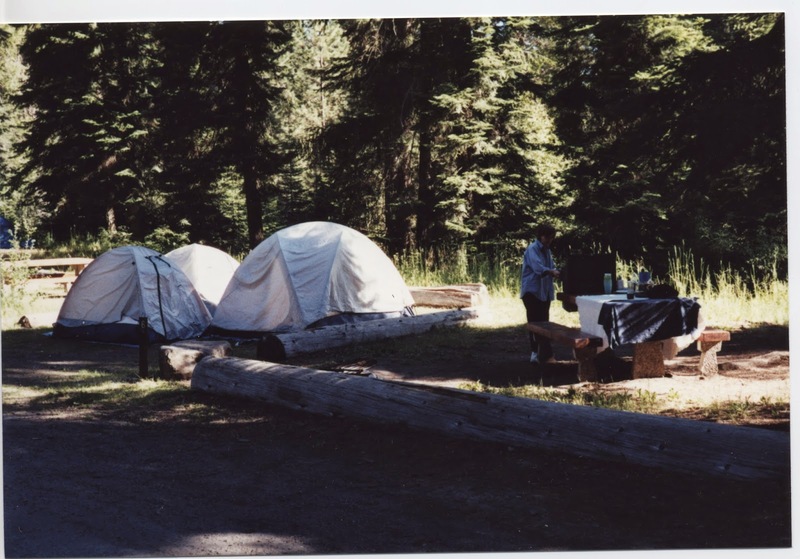 Each of us kids would take a turn riding on the back of the bike and we would stop and camp for the night. 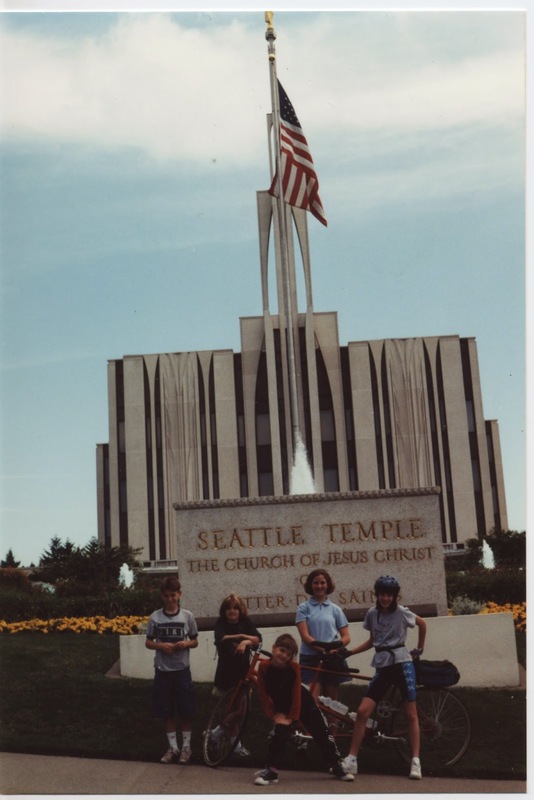 We rode from Seattle to Portland (temple to temple) and we rode from Seattle to Spokane (temple to temple). Look at these gems I found, I know I have a few more somewhere in a box. Start of our ride from Seattle to Spokane. (Jake, Sadie, Megan, Kim Kayner & Me). Sadie, Kim, Jake, Megan & Me. Sadie, Dad, Jake, Megan, Mom & Me. Mom cooking dinner at our campsite. 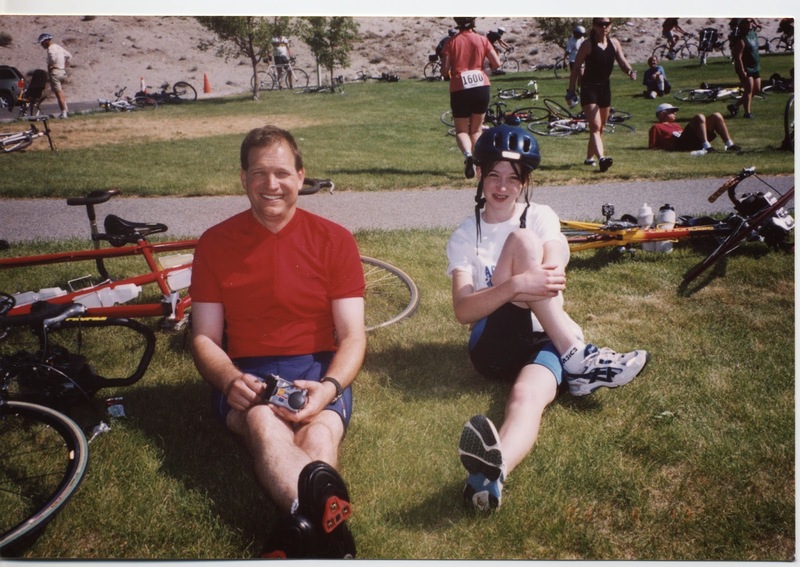 When I was sixteen years old I completed my first century (100 miles in a day) bike ride with my Dad and my Grandpa in Wenatchee, Washington. 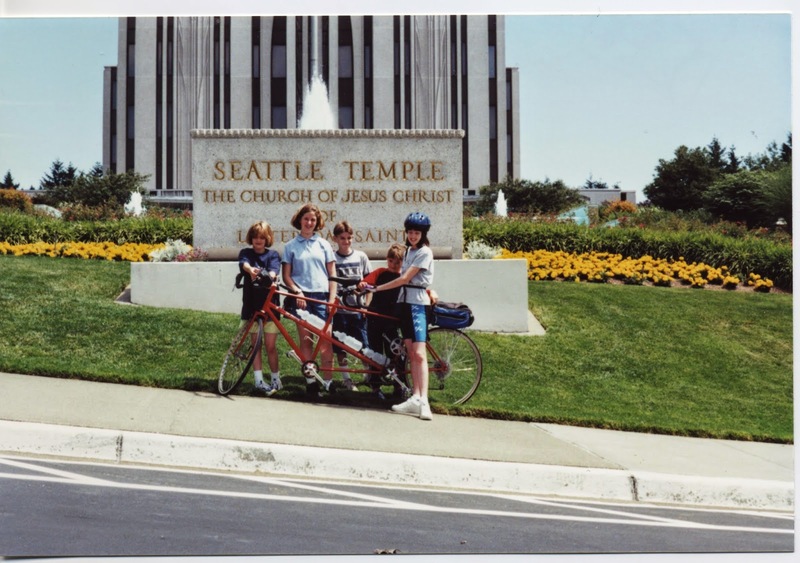 I'm pretty sure I was the youngest person to complete the century ride that day. I really enjoyed that ride. Was it hard? Yes, but it was such a good experience and I had a great time. Me & Dad getting ready for the start of our ride. Dad & Me at a pit stop. Shortly thereafter one of my sisters said she wanted to do a ride with my Dad. He signed them up for a metric century (about 75 miles in a day). The night before the ride she told my Dad she didn't want to do it so I ended up going on the ride instead. I remember that ride being really hard. The first part of the ride was uphill and we had a headwind both ways. By the time we finished riding it was pouring rain and the lightening had just started and that was the last long bike ride I went on. Two years ago I set a goal to complete another century ride and it didn't happen. Quite frankly I was afraid to ride my bike on the road while we were living in Utah. Utah drivers can be kind of crazy. We knew too many people who had been hit while riding there bikes and Andy had seen a handful of strangers run over. This year completing a 100 mile bike ride went back on my list of goals and this year I achieved my goal.